I heard a radio interview with Denis Avey some time ago and stuck the book on my Amazon wishlist as a reminder to get it at some point. On the spur of the moment I added it to an order and have now just finished reading it. This is an incredible, unique and yet fairly straight forward story. The young Denis Avey who joined the army to fight in the second world war was nothing special. He was a good marksman and engineer but not an officer or hero who won many meddles in any single great action. He is just a simple soldier doing his best and fighting his war. What makes this man and his story unique is a simple drive to see what is happening, to observe and record every detail. 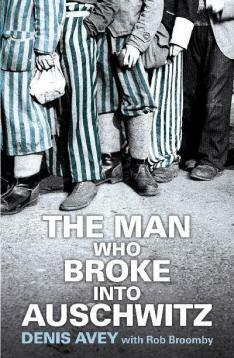 In North Africa his vehicle was blown up and he was captured, transported to Italy – torpedoed, escaped and re-captured – he was then a PoW in various camps until eventually being placed in the allied labour camp, E715, near Auschwitz III where both allied prisoners and jewish were put to work in the nearby IG Farben factory. Here, while Denis and the other PoWs suffered greatly they saw that their treatment was little compared to what was happening the the ‘strippies’ who were being worked to death every day. In small ways the PoWs would try to help the jews – leaving food or cigarets for them – but there was little they could do. In the book it appears to be common knowledge about what is happening to the jewish prisoners. If they aren’t fit to work they are taken off and ‘go up the chimney’ by this stage in the war, at least to those who are there, it is clear how the concentration camps operate. Denis is particularly struck by the different treatment of the Jews and manages to persuade one person to swap places with him so that he can see what conditions are really like across the wire in Auschwitz III. This experience, the final forced march out of E715 as the Russian army closes in, Avey’s escape and wild journey across Europe to liberty, is a fascinating read. Now that I have finished the story, as I tend to do, a quick search shows that there is some controversy over the accuracy of the story. To my mind it matters very little. That such things happened is important to remember exactly who and how they happened isn’t as important. I am from a generation never affected by the war – how will we keep alive and relevant the facts of such conflicts for generations to come. This is a good read. This entry was posted on Wednesday, January 30th, 2013 at 2:13 am and is filed under books. You can follow any responses to this entry through the RSS 2.0 feed. You can leave a response, or trackback from your own site.